Wedding events are normally divided into three distinct activity centers. The first activity center is the area where the reception and wedding ceremony take place. The second center is the dinner table area and the third center is the dance floor, which sometimes partly overlaps the dinner area. Each one of these activity centers provides a different experience to the guests entering it and spending time in it. The reception area is a “warm up” area intended to get the guests into the mood of a social event. The lighting, the music (provided by a live band or a DJ), the open environment, the sparse table setup and the waiters walking about, offering small, delicious hors d’oeuvres, are all intended to set a lighter mood and prepare the guests for the wedding ceremony. In the second part of the wedding event, the guests move on to the dinner table area, where most of the guests will spend the best part of the evening. The thematic branding of the event will be reflected primarily in this area. Our objective is to set in this area the desired mood – be it the mood of a prestigious event or the mood of an event celebrated around a specific theme, like love, summer, the 1960s, movies and so forth. We achieve our branding goal by adapting the furniture, the waiters’ uniforms and mainly the dinner table centerpieces to the design of the main theme. Anything on the table may contribute to or detract from the branding agreed upon with the event designer – the type of tablecloths, the color of the serviettes and the serviette rings or the dinner table numbers. 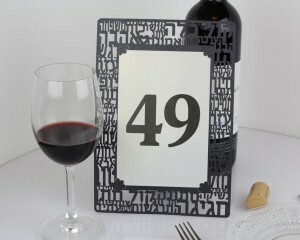 For this purpose, we at PaperBoutique created a collection of branding products for dinner table centerpieces, which includes branded table numbers. 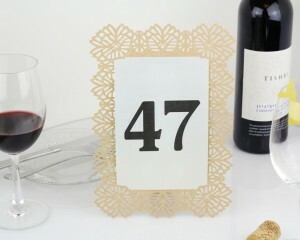 The number frames are produced using a unique technology for precise paper cutting. This technology enables us to produce lace elements or captions that match the over-all branding. The table numbers are highly prominent, so on the one hand – they make it easier to find one’s assigned table, while on the other hand they contribute significantly to the branding of the dinner table. 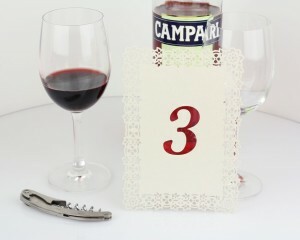 The table numbers also fit well with the seating cards and wine glass ornaments by PaperBoutique. 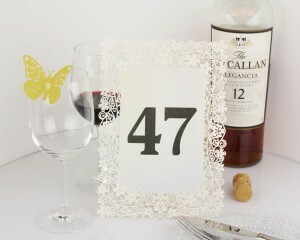 We offer table numbers in several designs that match our wedding invitations, so as to create a comprehensive and uniform branding theme. The branding of the event makes it possible to get the guests into a mood that separates them from their everyday environment, thereby giving them the opportunity to feel free – the same feeling that you get when you check in at a resort hotel on your vacation, which provides a setting that takes you away from your grueling everyday routine. The more items within the venue this branding effort encompasses – the stronger this feeling will be. 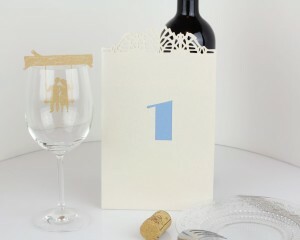 The branding effort also helps the guests, who attend several weddings each year, to remember this particular event as a special and unique event for a long time to come. We invite you to consult our designers about branding your event.